The Phillies have announced the signing of infielder/outfielder Alexi Amarista to a minor league contract. He’ll head to minor league camp with his new club. The addition of Amarista should help make up for the loss of fellow utilityman Ryan Flaherty, who opted out of his minors pact with the Phillies last week and then signed a major league deal with division-rival Atlanta. Amarista, meanwhile, exited the Tigers last week after a failed bid to earn a big league spot with them. A veteran of the Angels, Padres and Rockies, Amarista has never posed a threat offensively since debuting in 2011. That was again the case last year as a member of the Rockies, with whom Amarista hit .238/.269/.351 (45 wRC+) in 176 trips to the plate. He did line up at every outfield spot and three more in the infield (second, short and third), however. Despite his defensive versatility, the 28-year-old Amarista seems like a long shot to make an impact in Philly. The team just added highly touted prospect Scott Kingery to its roster Sunday, and he’s likely to move all around the diamond. Kingery’s part of an impressive array of starting-caliber position players in Philly, which also has Pedro Florimon and Roman Quinn as infield/outfield types on its 40-man roster. The Tigers have granted infielder Alexi Amarista his unconditional release, the team’s PR account has tweeted. According to MLB.com’s Jason Beck, Amarista had said just yesterday that he’d wait until the end of camp before “weighing his options”, but something seems to have changed in the past 24 hours or so. The 28-year-old had signed a minors deal with Detroit late in January. Amarista finished the 2017 season on the Rockies’ roster, with whom he hit just .238/.269/.351 across 176 plate appearances. While he filled in at many different positions around the diamond, defensive metrics rated him poorly at each one of them. Overall, fWAR, bWAR and WARP agree that he played about a win below replacement level, which is notable considering he accrued under a third of a season’s worth of plate appearances. As such, the club decided to pay him a $150K buyout rather than pick up his $2.5MM option. The decision for a rebuilding Detroit club to release Amarista doesn’t come as much of a surprise. It’s likely that said decision was influenced by the desire to keep number one overall Rule 5 pick Victor Reyes on the 25-man roster. The club would also probably like to give Niko Goodrum and JaCoby Jones a chance to prove themselves at the major league level. Amarista owns just a .231/.275/.323 slash line across career 1,901 plate appearances with the Angels, Padres and Rockies. While his bat obviously doesn’t provide any value, his ability to play both middle infield positions (in addition to third base and the outfield) has kept him working at the MLB level since his 2011 debut. The Tigers have reached a minor-league deal with veteran infielder Alexi Amarista, according to Anthony Fenech of the Detroit Free-Press (Twitter links). He’ll receive an invitation to participate in MLB camp. Amarista, 28, spent the 2017 season with the Rockies. The Colorado organization declined a $2.5MM club option for the coming season, preferring instead to pay him a $150K buyout. There’s little to love about Amarista’s offensive profile. He has never hit much, but his output has not even kept pace with the standard he set earlier in his career, when he was a heavily used player with the Padres. Over the past three seasons, Amarista owns a marginal .225/.268/.301 slash line with six home runs and 15 steals over 683 plate appearances. Clearly, the work with the bat does not explain Amarista’s appeal. Rather, it lies in his defensive versatility. Amarista has spent most of his career playing the middle infield, especially short, and also has significant time at thrid base and across the outfield (including in center). For Detroit, Amarista represents some much-needed veteran depth. He could challenge for a reserve role in camp along with fellow non-roster invitee Pete Kozma. Yet more opportunity could open up if the Tigers end up dealing shortstop Jose Iglesias. The Rockies have declined their $2.5MM club option over utility infielder Alexi Amarista, reports MLB.com’s Thomas Harding. Amarista will receive a $150K buyout and head back into the free-agent market this winter. Harding also notes that Greg Holland’s player option has now been formally declined — an outcome that had been previously reported upon. Amarista inked a one-year pact with the Rox last winter after spending the majority of his career with the division-rival Padres. Amarista’s role in Colorado was a limited one, as he appeared in just 96 games and totaled 176 plate appearances. While he gave first-year Rox skipper Bud Black some versatility on the defensive end of the spectrum — Amarista saw time at second base, shortstop, third base and in all three outfield spots — the 28-year-old wasn’t able to provide any value at the plate. In his 176 PAs, Amarista batted just .238/.269/.351 with three homers and 10 doubles. Defensive versatility with questionable offensive output has been the norm for Amarista throughout his career, however. In parts of seven big league seasons, he’s a career .231/.275/.323 hitter in 1901 plate appearances. He’ll likely draw interest from clubs looking to add veteran depth options that can compete for a bench spot next spring, but his struggles at the plate in one of the game’s premier offensive environments make it likely that Amarista will have to settle for a minor league deal this time around. Braves righty Daniel Winkler, who underwent Tommy John surgery in 2014 and missed most of last season, left the club’s game Sunday in agony with a fractured elbow, Mark Saxon of ESPN.com was among those to report (on Twitter). Winkler, whom Atlanta took from Colorado during the offseason’s Rule 5 draft, was off to a hot start as a member of the Braves’ bullpen. Prior to the injury, he had gone 2 1/3 innings without allowing a hit or a run, adding four strikeouts against one walk. It’s currently unknown how much time Winkler will miss, but given the significance of the injury, the rest of the season seems like a strong possibility for the 26-year-old. Cardinals lefty Marco Gonzales is deciding whether to undergo elbow surgery after consulting with doctors, including renowned orthopedic surgeon Neal ElAttrache, tweets Saxon. It’s unknown what type of surgery Gonzales is considering, writes Jenifer Langosch of MLB.com. If the 24-year-old undergoes Tommy John surgery, he’d face a 12- to 18-month recovery, Langosch notes. Prior to notifying the Cardinals’ medical staff of elbow discomfort during the final week of Spring Training, Gonzales was expected to serve as rotation depth for the club this season. Gonzales, who dealt with shoulder issues last season, has logged a 4.82 ERA with 7.7 K/9 against 5.3 BB/9 in 37 1/3 MLB innings. 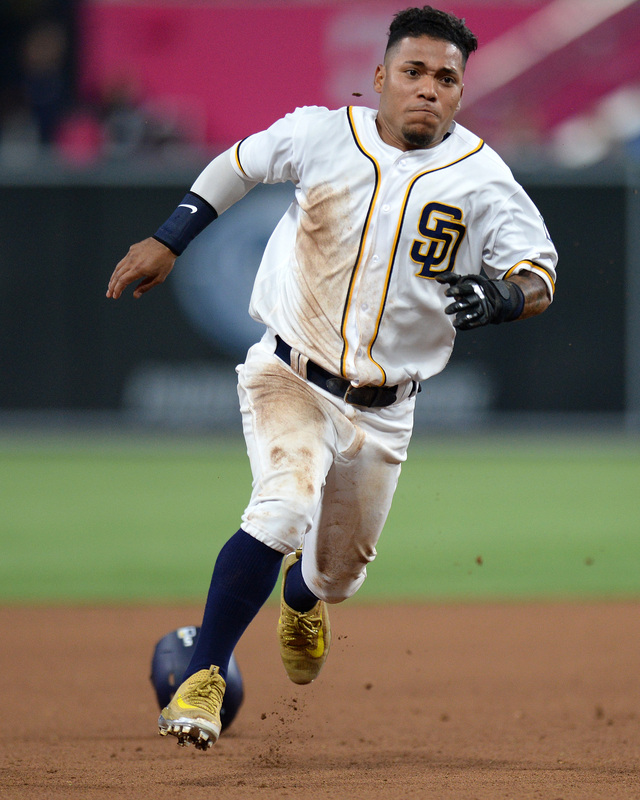 Padres third baseman Yangervis Solarte is headed to the 15-day disabled list with a right hamstring injury, paving the way for the call-up of utility man Alexi Amarista, according to Jeff Sanders of the San Diego Union-Tribune. Solarte slashed an eye-popping .375/.474/.563 over his first 19 plate appearances this year. Amarista fared well in a minuscule sample size for Triple-A El Paso to start the year, but he recorded a weak .204/.257/.287 in 357 PAs for the Padres last season and hasn’t exactly been stellar in his 1,575 big league PAs (.227/.274/.325). He does, however, offer versatility, having spent time at six different positions in the infield and outfield during his career. Another past Tommy John recipient, Mets reliever Josh Edgin, began a rehab assignment Sunday with 2/3 of an inning at Class-A St. Lucie and is on track for an early May return, reports Anthony DiComo of MLB.com (Twitter link). The southpaw last saw action in 2014, when he served as a shutdown option for the Mets in compiling a 9.22 K/9 and 1.98 BB/9 to accompany a stingy 1.32 ERA in 27 1/3 innings.